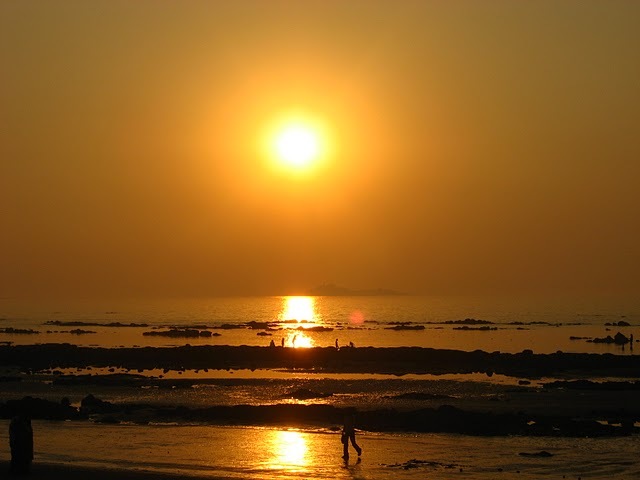 Alibag the coastal town, derives its name from the gardens of a person called Ali. The place has huge plantations of coconut and beetle nut. Headquarter of the Raigad district Alibag is a beautiful beach town nearest to the bustling metropolis of Mumbai and a favourite weekend getaway for the residents of Mumbai. The small town of Alibag was previously a village Ramnath and along with Ramnath there were other villages which are supposed to be hinterland of Bene Israeli Jews. Ali, belonged to this community and owned huge gardens and people used to call it as “Alichi Bag” in the local dialect which means Gardens of Ali and hence the name Alibag stuck to this pristine beach town. The credit for the development of this place from a village to a town goes to Chhatrapati Shivaji maharaj, a visionary who proclaimed a self rule in the Maratha region in the early 17th century. Chhatrapati Shivaji, always maintained the importance of a naval base and a strong fortress to guard it. His naval admiral Kanhoji Angre designed and planned the fort and the city. Many battles were fought for the accession of the fort which was eventually won over by Angre. So much was his might that he started his own currency with Alibag Rupaiya! Today the town and its nearby villages have become a famous haunt for the farmhouses of various celebrities and as the nearest town for a bit of rejuvenation from Mumbai. 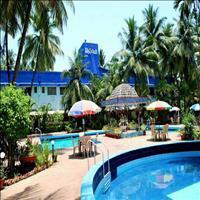 In Alibag you will get ample varieties of fish and various tropical fruits to eat. Located at 30 kilometers south of Mumbai. 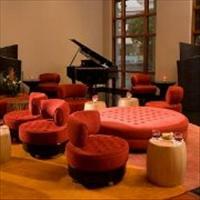 Pleasant climate throughout the year as it is a beach town. Maximum temperature in summer months may rise at 35 degrees Celsius while minimum temperature during the winter months may go down to 14 degrees Celsius. 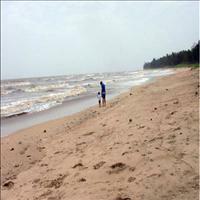 The beach of Alibaug is what attracts the tourists most. The Pristine beach is calm and peacefull with palm and coconut trees fringed on the shore. 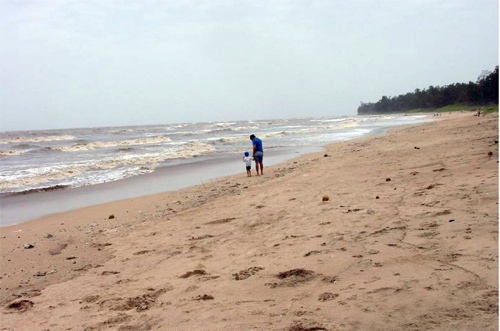 Nearby are other famous beaches like the Kashid (white sand beach) and the Kihim beach. 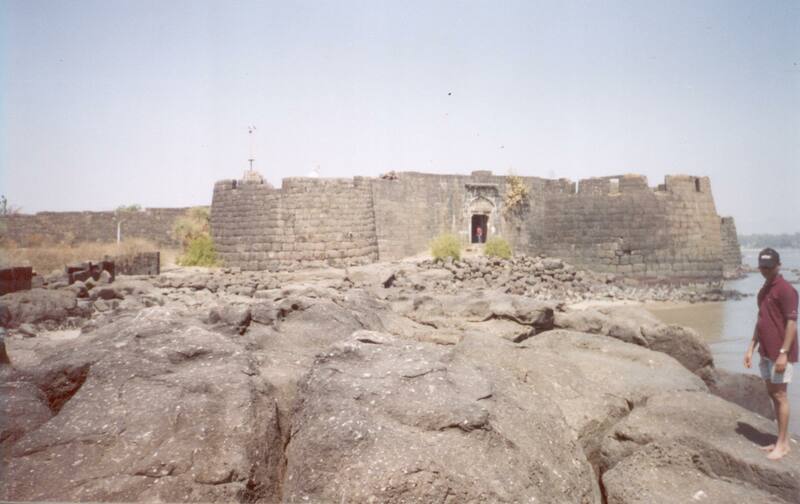 Famously known as the Kolaba fort, it is located 1 km across from Alibag beach. The Great Maratha-warrior Shivaji started the construction of this sea fort in 1680 A.D. The fort is 900 ft. long, 350 ft. wide and has 25 ft. high walls which have 17 bastions (burj) on all sides. The fort has been standing for over 300 years. The fort can only be accessed during ebb tide through a narrow strip of land which goes underwater during high tide. The huge front entrance arch has tigers, peacocks, elephants sculpted on it. Beyond that comes another small gate. Next to that gate are the shrines of Mahishasura and Padmavathi, Kanifnath, Sri Ganesh and the fort-deity. Next to them comes the sourthern gate which is variously known as Darya/Yeshwant Darwaja. 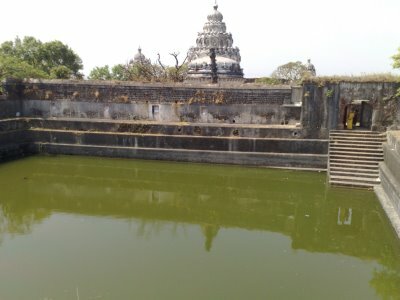 Raghoji Angre built a beautiful temple of Shri Ganesh in front of the sweet water tank in 1759. The inner sanctum sanctorum includes images of Sri Ashtabhuja Devi, Shiv, Vishnu, Surya. The collection of the pantheon lends it the name 'Shri Ganesh Panchayatan'. Within the premises, you will find a well and a tank of sweet water in the midst of sea! On one of the 17 bastions, two cannons in intact condition can be seen. The Archaeological Survey of India charges a token entry Fee for the visitors.